HGP – Anutra Medical Launches into National Dental Distribution with NDC, Inc.
MORRISVILLE, N.C., Aug. 15, 2016 /PRNewswire-iReach/ — Anutra Medical continues its momentum of rapid growth by selecting NDC, Inc. as their first master distribution partner. 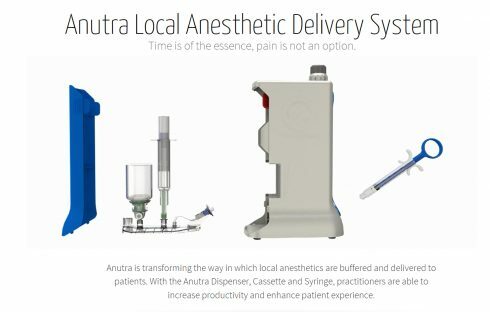 In April 2015, Anutra Medical began selling the Anutra Local Anesthetic Delivery System directly to dentists. After a year of successful growth in sales, Anutra Medical strategically selected NDC, Inc. and its dealers to be their first distribution partner to help continue the exponential growth. NDC, Inc., headquartered in Nashville, Tennessee, provides a wide range of customized solutions for manufacturers to expand their reach. With over 1,400 distributors, NDC will expand Anutra’s ability to reach even more customers. In the short year Anutra has been selling its local anesthetic delivery system, the company is on track to see nearly two hundred percent growth in revenue in 2016. “As I sit with practitioners using our products, it is so impactful to know we are fulfilling our purpose and vision of eliminating patient’s fear of local anesthesia. It greatly excites me to know that with NDC, we will magnify our impact and be that much closer to change the perception of local anesthesia for the better,” explains Cameron Perkins, CEO of Anutra Medical. Anutra Medical plans to launch its sales efforts with NDC in September 2016. Located in Research Triangle Park, NC, Anutra Medical is a team of experienced dental and health care professionals focused on providing solutions to enhancing the patient experience and increasing office efficiency. We are leveraging the science of buffering local anesthetics through our innovative and revolutionary delivery system. Our core belief is creating partnerships with practices. We foster these relationships by either performing in office implementations or utilizing technology for educating and training.